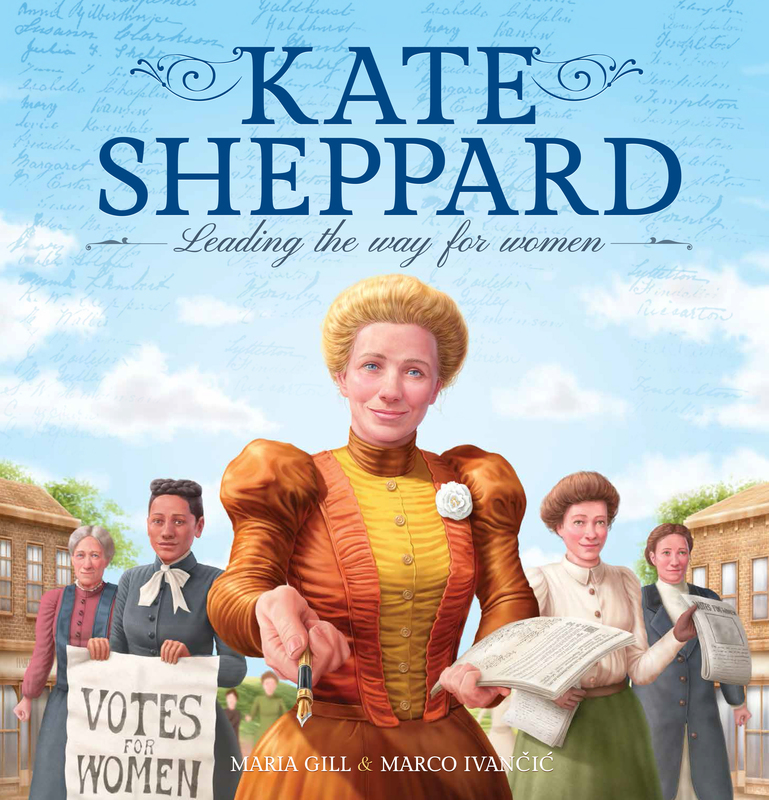 Kate Sheppard : Leading the way for women. Another book by award winning duo. Author @mariagillnz and illustrator Marco Ivancic are back again with a fine new book for children. Before I even began reading the story of Kate Sheppard, I spent ages just checking out the end pages and the wonderful map of the world from 1855. The world has changed so much since Kate sailed from one end of the world to the other; a journey which took around three or four months way back in 1869 when Kate left England to move to New Zealand. Kate wanted to change things in life right from when she was young. Her perseverance over the years paid off as she did make changes, including being one of the first women ever, to ride a bike. Her biggest achievement was of course gaining the right for women to vote. It was on this day, 28th November 1893, 125 years ago, that women went to the polling votes for the first time, anywhere in the world. A huge achievement from a woman who never gave up on her dream. Kate was dedicated and determined and this creative non-fiction picture book tells us her story and how it all happened. While Kate Sheppard started something amazing, you will see by reading the page Female (in)equality, there are sadly, many countries where girls and women are still not treated fairly. Kate was a woman ahead of her time but she will not be the only one, others have, and will continue to make changes for equality for women and girls everywhere. Check out the trailer for a sneak peek at the book. The research is, as always, spot on and the illustrations make this another top choice. The inclusion of a glossary, maps, and a timeline make this a wonderful resource for school libraries and teachers. Teacher notes can be found here. There is a very cool site here where you can type in the names of your great, or perhaps, great, great grandmothers and see if they signed the petition. I am very proud to say that I found my Great Grandmother had signed the petition. Considering she went on to have nine children I think that was super cool. Maria Gill and Marco Ivancic deservedly won the prestigious Margaret Mahy Book of the Year Award in 2016 for their book ANZAC Heroes. They continue to bring quality books and ANZAC Animals is destined to be another hit. Maria Gill’s research for her non-fiction books is her trademark. She finds the stories, painstakingly does her research for accuracy and then writes her books taking time to polish to perfection. ANZAC Animals delivers another well-formated non-fiction book. All the text features are there; introduction, contents, glossary, charts, photographs, index etc. with the addition of maps and timelines. The layout is well placed and easy to read. 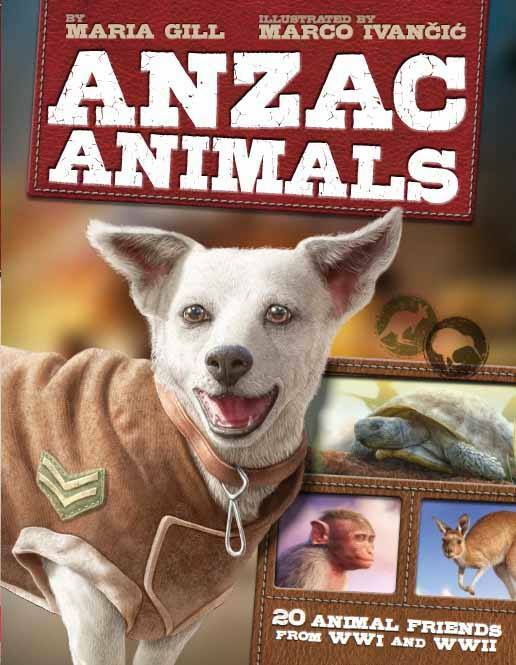 ANZAC Animals is a collection of true tales of animal heroes and mascots from World War One and World War Two. The collection is both fascinating and delightful. I love the story of Lulu the chicken mascot who would warn soldiers of approaching enemy aircraft with her noisy shrieking so that they had time to hide safely. Or the story of Torty the tortoise, who became a listening ear to James Stewart Little as he described the horror of the things he saw during WWI. Believe it or not Torty is still alive today – 100 years later. This is an extraordinary collection of tales about animals in war. There are dogs, horses, mules, pigeons, and even a monkey. They all had one thing in common. The animals were the companions of soldiers. They helped soldiers cope and in many cases, helped them survive the atrocities of war. One of the most famous is of the story of Murphy the donkey who carried injured soldiers to safety. The stories of soldiers have long been told but sometimes animals are heroes too and this book is all about the animals and what has made them all so special during some of the worst of times. The illustrations are very impressive and very life-like. The colours and tones are beautiful. Every hair, whisker or feather is so real you wish you could almost leap into the page and pat the animals. An excellent book and a must-have for any library. Check out author Maria Gill’s book trailer and see for yourself just what is so special about this book. More than 300 years ago, a young Dutch sailor named Abel Tasman stood on the prow of a ship he and his crew had sailed across wild, uncharted waters. In the distance, through a shroud of mist, the rugged outline of steep hills rose from the ocean waves. Could this be Terra Australis – the great southern land? Having read a number of Maria’s books over the years the one thing that stands out is the depth and standard of her research. The information in her books is always well planned, informative, yet easy to read. Maria maintains this standard in her latest picture book about Abel Tasman. It is a biography in story book format which will appeal to younger audiences. We begin with Abel as a young boy listening to tales of the sea and his desire to be a sailor. We follow him on his journeys as he later sails the seas and into a world of adventure and exploration. We are with Abel in stormy seas, when under attack, and even with an earthquake. The scary thing is I have just been re-reading this book, and was on the page about an earthquake they had felt when really freakishly, we have just had our own 4.1 quake here in Christchurch as I write. That is just a bit too scary and too freakish for my liking. I don’t think I will re-read the page about a volcano erupting, but it is there in the book if you want to know more about Tasman’s adventures. Maria has collaborated once again with illustrator Marco Ivancic to produce another quality book. His illustrations have that photo-realism quality making everything believable. The maps on the end pages are a perfect backdrop to the history of the world when Abel Tasman was exploring. The pages towards the end of the book provide extra details and facts to give more understanding to Abel’s story. 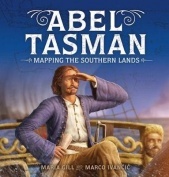 Abel Tasman: mapping the Southern lands is another winning collaboration between author, illustrator and publisher. This is one of those very special books that will capture a wide audience. Teachers, librarians, students, parents and grandparents will love this book. It is a beautifully produced, hardback non-fiction book of biographies of some of our ANZAC heroes. This superb book features the lives of 30 Australian and New Zealand ANZAC Heroes from both World War One and World War Two. This is a very well researched project and is quite simply, stunning. I believe this is a winner and should be in every school library. This is one of those books you want to pick up again and again. It is about saving lives, imprisonment, courage and bravery. It is about ordinary people doing extraordinary things to serve our country. Their stories are real and heroic. I loved reading about Olive King. I confess I had never heard of her before but after reading her biography, I now admire her so much. Having been told war was no place for women, Olive proved otherwise and volunteered to drive ambulances. Olive also took up courses in first-aid and motor repairs. Later she transported wounded soldiers. She went on to do so many extraordinary things. Try reading about Captain Charles Upham, one of only three soldiers to ever win two Victoria Crosses. An amazing achievement. As a non-fiction book this is a perfect example for others to follow. It has it all. Contents page, introduction, glossary, maps, timelines, bibliography, list of websites, photographs, illustrations, and of course detailed biographies. The language and text is suited to readers of all ages. I loved the double page spread of the timelines of each war. Brief but very informative and so easy to follow. There are some great teaching notes to support this book and I do encourage teachers to use them to make the most of this wonderful resource.